An expert conference on mobile communications and digitization will be held at NürnbergMesse from July 9 to 11. Participants include the "who's who" from the world of telecommunications. Network operators, representatives of regulatory authorities and high-ranking managers of standardisation bodies from over 60 countries have accepted an invitation from the global company SIGOS, which is hosting the conference for the twentieth time. More than 20 international experts will give presentations and share their experiences in panel discussions. The bandwidth ranges from the latest network technology (5G), Internet of Things (IoT) and the optimization of existing networks to smartphone apps and new applications for the future. Around 400 participants will learn about the latest trends and strategies for the most perfect user experience possible, for which the Nuremberg-based company SIGOS develops solutions. 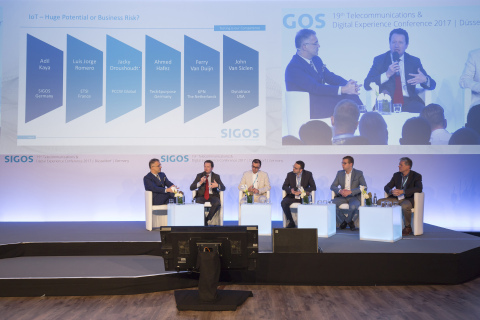 "Our conference has become one of the most important events for network operators worldwide," said Adil Kaya, CEO of SIGOS. "As a company that has been committed to service quality in telecommunications since the early days of mobile communications, it is extremely important to us to create a global platform for sharing experiences. We are very pleased to be able to hold this conference in Nuremberg again. We have locations on three continents, but our main office and the company headquarters are here in Nuremberg. We are therefore also delighted that Nuremberg's lord mayor Dr. Ulrich Maly will open the conference with a welcome address," Kaya continued. For almost 30 years, SIGOS has been perfecting active end-to-end testing in telecommunications and, for a number of years, in the digital world as well. "Communication is becoming increasingly complex. Smartphone apps are a kind of standard means of communication in many areas, whether for banking, shopping or mobile television. So it made sense to include the testing and monitoring of these forms of communication in the SIGOS portfolio," explained Kaya. With such testing and monitoring, the user experience is carefully examined to ensure that, for example, the checkout of an online shop works on a smartphone reliably. "The expectations for this multi-day conference are high. Most participants have long journeys behind them and expect a conference program that demonstrates how mobile networks and services can be further optimized and what is important for the future. We will see the fruits of months of preparation at the beginning of the conference on July 10," said Bjorn Koetz, Head of Marketing and Business Development of SIGOS. With over 450 network operators in 156 countries, including the top 100 mobile networks, as well as over 600 enterprise customers, SIGOS is the worldwide leading provider of active test solutions for securing network quality and services via mobile networks worldwide. A total of 350 employees work in offices in Nuremberg, Ghent (Belgium), Singapore and San Mateo (USA), in addition to sales and support staff in numerous other countries.